After arrival from Dublin we board a private bus transfer from Santiago airport South to Valenca crossing the river Minho which acts as the border between Portugal and Spain. 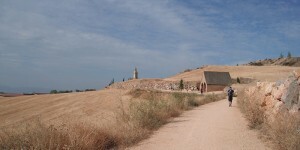 The highlight of the evening will be visiting the huge Fortaleza fortress which overlooks the border. It has been a major military site from earliest times and is now a great attraction with its narrow streets full of small shops, cafes and bars. You can even stroll across the 1886 road and rail bridge to Spain if you wish! Our first day’s walk brings us across the bridge into Spain and to the town of Tui. 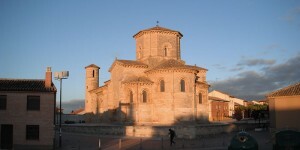 This historical border town has a beautifully preserved medieval centre with its Romanesque Catedral de Santa Maria. Our path through the town is on narrow streets which wind their way to the outskirts and open country to our coffee stop at Orbenlle. The recently opened country path and quite road from here to Porrino is a welcome alternative to the long slog through industrial estates endured by walkers up to 2013. A relatively short day’s walk today sees us reach the high point at Monte Cornedo from where the coast on our left comes into view. Our coffee break is 7.8km and then it’s a welcome downhill stroll into the town of Redondela for lunch. Our hotel however is not in the town itself, as we will transfer to the coast and stay at Hotel Antolin which is literally a five minute walk from the beach. Our day’s walk is actually shorter because Hotel Antolin is on the ‘right side’ of Redondela! An early coffee break at Arcade after 6km or so and then on to Pontevedra which is the regional capital and lively town with a population of 75,000. We’re staying in the town centre and will be spoilt for choice when it comes to enjoying the evening. We leave Pontevedra along the Rua da Santina and on through chestnut groves. After our coffee break at San Amaro, 10km, we pass through small villages and on to the town of Caldas where Thomas Becket rested in 1167 on his pilgrimage to Santiago. The church built in the 1890’s and dedicated to him, can be visited in the old quarter. The town is famous for its thermal waters which have been at a constant 40 degrees for thousands of years enjoyed by early Celtic tribes, the Romans, and kings of Spain during the Reconquista. Todays walk takes us along natural pathways and woodland and through river valleys stopping at the 6.5km mark for our coffee break. Then it’s on to Padron which is one of the most famous towns on any of the Camino Santiago routes. According to legend, it was here that the stone boat carrying the remains of St. James after his martyrdom landed on the shores of Galicia. Our final day’s walk brings us to the Praza de Obradoiro and the Cathedral in Santiago. It is the longest stage, so we’ll leave early to get full value for our time on arrival. Although we are nearing the City, our route takes us along pathways and through small hamlets before entering the suburbs where we can see the Cathedral spires in the distance. The comfort of our four star hotel awaits us before exploring the city that evening. Relax, explore or go shopping! Visit the Cathedral for the famous Pilgrim’s Mass at midday, present your stamped passport, ‘Credencial do Peregrino’ and collect your Compostela from the Pilgrim’s office. We will then meet up for our airport transfer and flight home. This walk can also be done at any time of the year on a self-guided basis. Staying in rural towns and villages, many dating back to the 9th century with remains of Romanesque churches and early pilgrim hostels. Walking on well maintained tracks and paths through meadowlands and forests of poplars and eucalyptus. Entering the World Heritage City of Santiago and visiting the imposing Cathedral which evolved into the magnificent structure it is today over hundreds of years. Enjoying the company of fellow travellers from far and near along the way, or as we relax after each days walk. Please allow €12-15 per head for dinner.